Nepal Canid Project is an initiation of Friends of Nature (FON) to secure the future of canids in Nepal. Our vision is to create safe and secure viable population of canids in the wild surviving in mutual harmony with the local community. We aim to update the status of canids in whole Nepal and bring community, conservationists, and governmental agencies together for conservation. Our project has two distinct approaches for canid conservation. Our first approach is scientifically sound researches focused on canids. This means that statistically strong, cutting edge technology, and useful research for wildlife managers. The second approach is bringing the community forward as leaders and citizen scientists in conservation. For this, the initial step is making the community aware about the importance of canids through conservation camps, informal discussions, posters, and booklets. Secure the future of canids with active community-based conservation. 1. survey at least three different sites in the mid-hills of Nepal for canids (especially Dholes). 2. conduct conservation camps in at least 50 different communities of Nepal. 3. advocate for canid conservation. 4. collaborate/build network with governmental, non-governmental organizations and international conservation organizations, and communities for conservation of canids. 1. update the distribution of all canid species throughout Nepal. 2. create strong community support for canids through conservation awareness and wildlife-based tourism/income. 3. formulate and implement a nation-wide canid conservation action plan. 4. create an effective community run insurance policy for livestock depredation from canids. We know that your support is crucial for the success of our project. Our success depends on active involvement of local community too. Local community banning poaching and wildlife trade in their area will be a huge boost for conservation of canids. If you are a visual artist, you can help us design conservation posters and booklets, maybe even conservation videos for different target groups. We have found audio visuals to be very effective to grab attention of public. So, if you can help us out, it would be great. You can also help us fill the gaps in our knowledge of canids. If you have any information on canids inside Nepal, you can send them to us. Sighting coordinates or the general location with brief description and photographs are even better. donating used/new research equipment such as camera traps, GoPro, or GPS. giving us information and photographs of canids/providing us with feedbacks on our publications. funding us or collaborating on project. sharing your ideas/experiences of conservation and research. donating a powerful portable projector (required for conservation camps where there is no electricity). helping us create conservation games/materials. share insights on making camera traps theft proof. We had some unexpected success in our short journey. 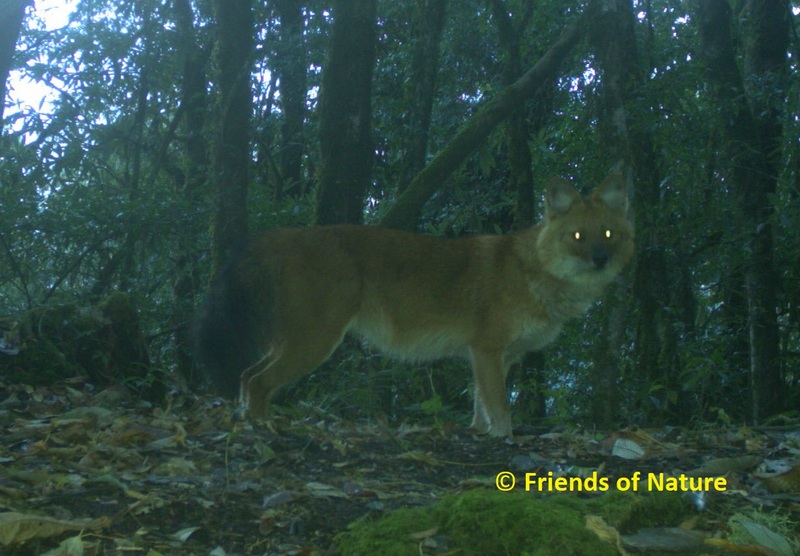 Our team was able to capture images of Dhole in Sikles-Tangting area in Annapurna Conservation Area. This is great news since locals had mentioned that Dholes had gone locally extinct. Similarly, we also were able to capture Dhole in Tinjure-Milke-Jaljale are in eastern Nepal, another area where Dhole were thought to be locally extinct.